Morning meet with our representative and leave for Hospet. On the way stop for lunch at Chitradurga. Further continue drive to Hospet. Arrive Hospet in the evening. Upon arrival check into the hotel.Overnight stay at hotel. 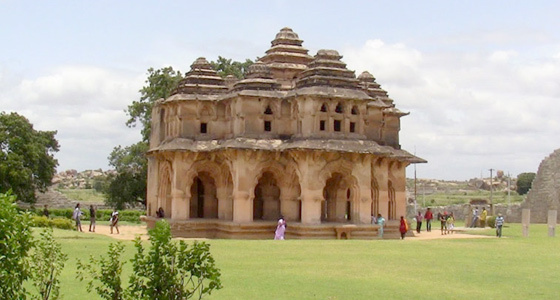 Today after breakfast we will enjoy the half day excursion to visit the ruins of Hampi. Later return to the Hospet. Hampi, the seat of the famed Vijayanagara Empire was the capital of the largest empire in post-moghul India, covering several states. The Vijayanagaraempire stretched over at least three states -Karnataka, Maharashtra, and Andhra Pradesh. 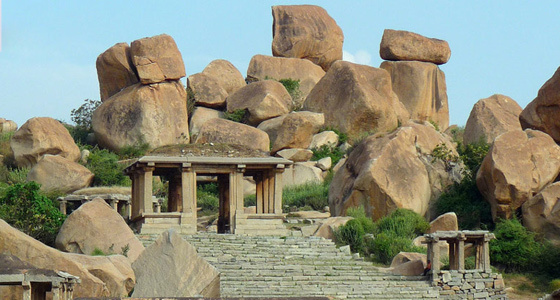 The destruction of Vijayanagar by marauding Moghul invaders was sudden, shocking and absolute. Although in ruins today, this capital city once boasted riches known far beyond the shores of India. 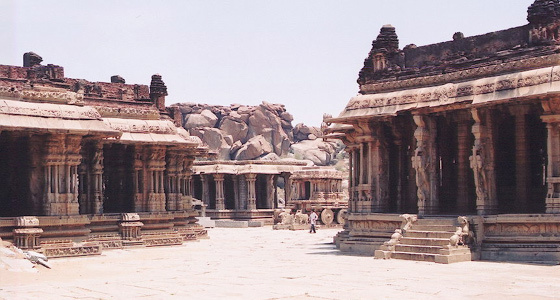 The ruins of Hampi of the 14th Century lies scattered in about 26 sq. km area, amidst giant boulders and vegetation. Protected by the tempestuous river Tungabhadra in the north and rocky granite ridges on the other three sides, the ruins silently narrate the story of grandeur splendor and fabulous wealth. The splendid remains of palaces express a tale of man's infinite talent and power of creativity together with his capacity for senseless destruction. 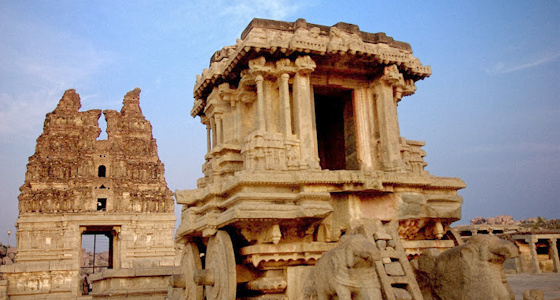 A visit to Hampi is a sojourn into the past. Most of the important structures and ruins are located in two areas, which are generally referred to as the Royal Centre and the Sacred Centre. A visit to Anegundi village by traversing the gushing Tungabhadra river on a coracle is an experience that provides the guests with a glimpse into the traditional country life in Karnataka. Later in the afternoon return to Hospet for lunch. Remaining day at leisure to enjoy the activities and facilities offered by the accommodation. Overnight stay at hotel. After spending a little time in the morning at the hotel, we will leave for Bangalore.